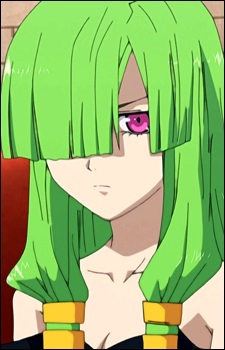 A mysterious green-haired young woman. She spends a great deal of the series "asleep." While in this "asleep" state, she takes the form of Mexiah, Chiaia's older sister. When the link between Mexiah and Doll is revealed, it is also revealed that Mexiah is not in fact Chiaia's biological sister. She is instead an artifact that was discovered along with the mysterious Seikishin. Doll has little regard for the importance of life, and laughs while trying to kill Aura during an early encounter. She's also openly contemptuous of Dagmyer even though the latter is technically her superior—going so far as to occasionally threaten him with her weapon. Despite this, she has an attraction to Kenshi that she believes is a remnant of when Mexiah's personality was dominant. She's quite capable of easily defeating nearly anyone that she goes up against in a Seikijin. The sole exception to this is Kenshi, and the two are only capable of fighting to a mutual draw. Her Seikijin is black, and wields both a scythe and a massive shield with a mouth capable of eating parts of her opponents.